Geometry has shown that the architecture was an expression of man and a basic principle that were always presented on an architectural work. The research was conducted through two steps with the first step was to identified the Tadao Ando’s geometry design principle through a content analysis approach. Based on the textual review, Tadao Ando's geometry design principle was tend to select the simple geometric forms as the embodiment of the building shapes. An user spatial experiences were created through inter space relationships and interactions with the surrounding environment through the geometry and shape processing and became the central to his architectural work creation. In other words, pure geometry concept was the instrument to presented all of those. The second step was to compared Tadao Ando's geometry design principles in the monistic architecture to the pluralistic architecture catagories using a precedent analysis approach. The comparisons toward the geometrical principles were more complex and quite varied geometric shapes in pluralistic architecture while simple geometric shapes can be found in the monistic architecture,as well as interlinked circular paths in pluralistic architecture which shaped by the ‘direction wall’ rather than a simple circulation path in the monistic architecture, and the wall-formed angle was a multiple of 15° in monistic architecture but varying angles in the pluralistic architecture. Ando, T. (2008). Tadao Ando 3 Inside Japan. Japan: Nobuyuki Endo. Chung, M. K. (n.d.). The Churches of Tadao Ando. Clark, R. H., & Pause, M. (2005). Precedents in Architecture: Analytic Diagrams, Formative Ideas, and Partis. New Jersey: John Wiley & Sons. Co, F. D. (1997). Tadao Ando: Complete Works. Phaidon Press. Furuyama, M. (1996). Tadao Ando. Basel, Boston, Berlin: Birkhauser Verlag. Gill, S. S. (2010). A Study of The Characteristics of Natural light in Selected Buildings Designed by Le Corbusier, Louis I. Kahn and Tadao Ando (Doctoral dissertation, Texas A & M University). Jodido, P. (2007). Ando: Complete Works. Berlin: Taschen GmbH. Putro, S. G. (2010). A Box That Provokes : Eksplorasi Sekuens Ruang Berdasarkan Gagasan Arsitektur Tadao Ando. 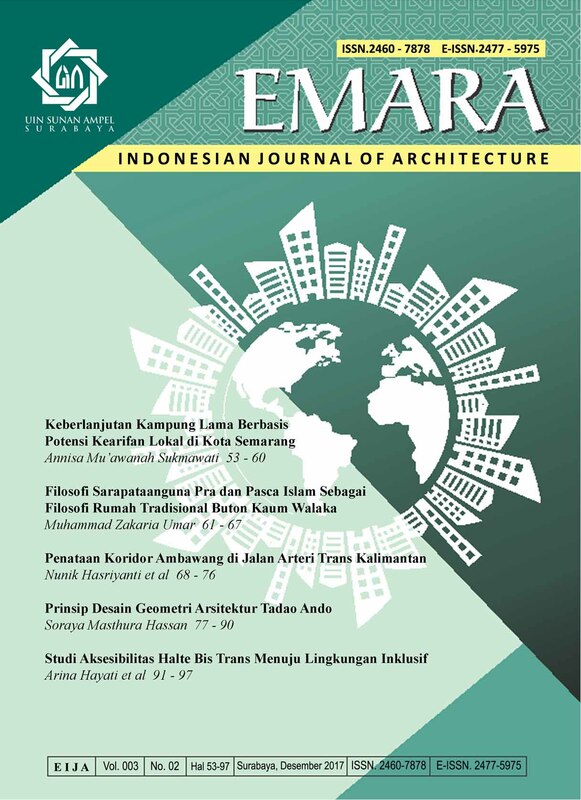 Jurnal Teori Dan Desain Arsitektur, 4(1), 23–34. Shirazi, M. (2012). An Investigation on Tadao Ando’s Phenomenological Reflections. Armanshahr Architecture and Urban Development, 4(8), 21–31.